This is my contribution to the “Weekly Photo Challenge: Up“, while I must admit that the husband of my mother took the photo, when he visited a friend who is living in an apartment tower. The quality of the photo is not so good but anyway I do like the image. 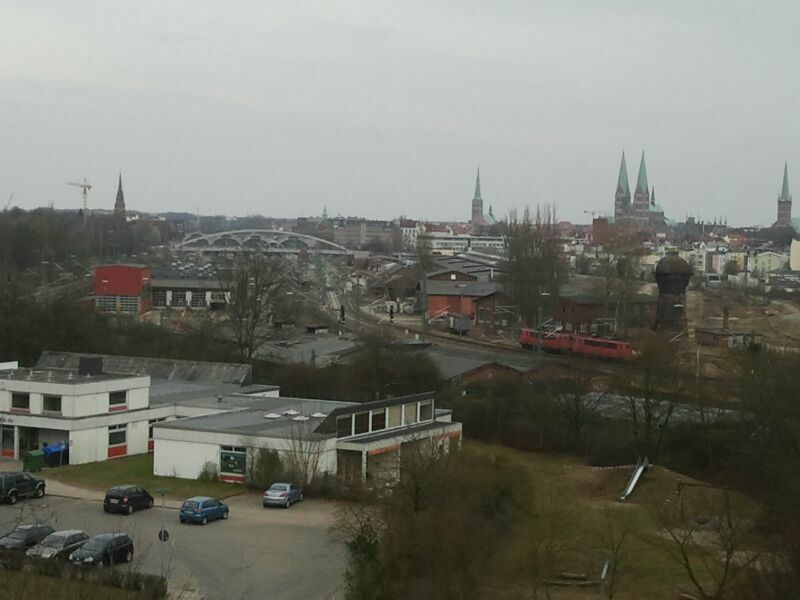 What you can see on the image, is a small part of Lübeck´s skyline. There is one old freight depot on the right side of the bridge and I took a photo some time ago. You can´t see it but in the direction behind the bridge is the train station of Lübeck. On the photo are also some of the seven bigger church towers of Lübeck, which are part of the townscape and seen on some lubeckian company Logos for example. Schwartauer Werke is for example one of those company’s. They have the seven church towers of Lübeck in their logo and they do create jelly and I think they are also international known. At least in some european country’s I heard. How wonderful that your mother and her husband think about your all important blog and pass on great pictures such as this.